This exhibition comprises a small group of spoons and ladles (shao or dou). All were made in China, with one exception, which is Korean. The spoons range in date from the Western Zhou dynasty to the Qing dynasty. 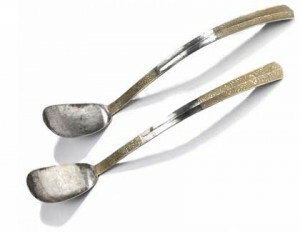 The exhibition serves to illustrate the different ways in which spoons were used in China, be it in rituals, for domestic use or on the scholar’s table. Click on the cover above to download the Chinese Spoons catalogue (429KB).